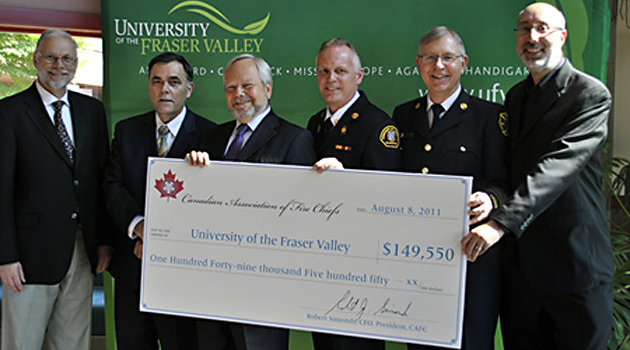 A cheque for $149,500 was presented to the University of the Fraser Valley (UFV) on August 8, 2011, kicking off research into a national database that could lead to fewer fires and more effective and efficient fire-service delivery across the country. UFV will conduct the research on behalf of the Canadian Association of Fire Chiefs (CAFC) to explore the development of a web-based database of fire statistics that would be available to fire departments and organizations across Canada. Funding for this project was provided through the Canadian Police Research Centre (CPRC), a Government of Canada program administered by the Defence Research & Development Canada (DRDC) – Centre for Security Science (CSS). As examples, data collected through the database could be used by fire departments to strategically deploy resources, or to amend buildings codes in response to fire trends. CPRC Executive Director Steve Palmer said the project is a good fit with the DRDC-CSS’s mandate, in that the data gathered will help Canadian fire services prevent fires and spare Canadians from their devastating effects. “We recognize the tremendous value in the development of a national fire incident capability as it will generate an evidence-based approach for decision-making, which will help improve the efficiency and effectiveness of fire services,” Palmer said. Beginning this summer, the year-long project will outline the scope for a national system, including types of data to be collected, hardware and software, partner roles and contributions, funding sources, and resources required to set up and maintain the system. The research will include consultation with fire services across the country, review of international best practices, and investigation of existing Canadian data management systems, such as FDM software and the Canadian Police Information Centre. Heading up the project for the CAFC is Len Garis, Fire Chief for the City of Surrey and President of the Fire Chiefs’ Association of B.C. Research for the project will be conducted by Dr. Darryl Plecas, Director of the Centre for Criminal Justice Research in UFV’s School of Criminology and Criminal Justice, and by Dr. Paul Maxim, Associate Vice-President of Research at Wilfrid Laurier University. A key focus of the research will be ensuring the proposed database will meet the needs of Canadian fire services. Information and updates about the National Fire Incident Database research project, including consultation sessions, will be posted on the Canadian Association of Fire Chiefs website, www.cafc.ca. The Canadian Police Research Centre (CPRC) is a Government of Canada program whose mission is to harness science and technology (S&T) knowledge to strengthen police, fire and emergency medical services across Canada through investments in research, development of standards, product evaluation and technology transfer. CPRC is managed by the Defence Research and Development Canada – Centre for Security Science, a joint endeavour between the Department of National Defence and Public Safety Canada to strengthen, through investments in S&T, Canada’s ability to prevent, prepare for, respond to, and recover from accidents, natural disasters, or terrorist and criminal acts that impact the safety and security of Canadians.